Yep, I'm the same Athena who sent you the info on the Egyptian Mau belly flap. The photo was my Ankhesenamen. A huge genetic study done in 2007 by U.C.Davis which took DNA samples from domestic cats around the world can be seen here. In it, they determined that the "Egyptian Mau", which is a breed mainly descended from two naturally spotted cats owned by the Princess Troubetskoy, is not actually Egyptian in heritage. It is most closely related to the Turkish Angora, while the breed that is most closely related to native Egyptian feral cats is the Turkish Van...the two Turkish breeds are separated by geographical barriers, and are only related to each other distantly. Because the Egyptian government has for many years had a policy of sending out employees (veterinarians!) to put out poison for feral cats and dogs, and also shooting them, a group of us are now attempting to have the native Egyptian cats recognized as their own breed, the Nile Valley Egyptian. You can read more about this problem, and follow our progress, at: Maati -- sorry link broken at Jan 2013. I'd really appreciate it if you could help us spread the word about this problem. We're looking for other people who would like to get involved. Application has been made to TICA for status as an Experimental New Breed. Designation, a Natural Breed indigenous to the Nile Valley of Egypt. All colors, no outcrosses. There are 3 Breeders at this time. There are 3 color divisions: Standard (solids, solid-and-white, tortoiseshell, calico), Agouti (like an Abyssinian, individual hair shafts are colored in bands), and Lybica (spotted, striped, solid and agouti, all with stripes on the tail, on the middle third of all four legs, and face markings including eyeliner, mascara, and forehead markings). This is the oldest existing domestic cat breed in the world; the "Feline Missing Link" between all domestic cats and their only wild ancestor, the African wild cat (felis sylvestris lybica). It is not related to the Egyptian Mau. 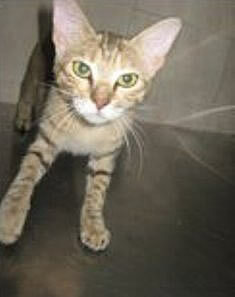 The photos above are all from the "Adoptable" page of EMRO, the Egyptian Mau Rescue Organization. EMRO was named years ago, before we decided to attempt to have Egyptian cats recognized as their own distinct Natural breed (this year). These are all photos of cats which were rescued off the streets of Cairo by EMRO. Because they are Egyptian ferals, they will be the foundation for the Nile Valley Egyptian breed. Twilight (the solid black) and Jameela (the bronze spotted and striped) are scheduled to be airflown from EMRO in Cairo to me in Houston some time this month, and will be my first two queens in the beginnings of my Nile Valley Egyptian cattery, Maati. I'm hoping to acquire a red spotted male as my first stud. (Toffee and Calli are still available for adoption...if you have any interest.) As I mentioned in the breed description, we expect to see 3 color divisions among the native Egyptian cats, Standard, Agouti, and Lybica. Some of these photos demonstrate the Standard colors, which are solids, solid-and-white, tortoiseshell, and calico. Twilight is a solid black. Toffee (the kitten) is a red-and-white male. The fourth, the tri-color, Calli, is a calico. (With only 4 photos, I ran out before I got to the tortoiseshell cats, but there are photos of several on the EMRO adoption page, if you want to look there). Jameela is a bronze spotted cat. She demonstrates the Lybica coloring. I don't currently have any photo examples of the Agouti coloring, but they will look much like Abyssinians, which have the "agouti" gene. Red and blue spotted (and striped) cats occur naturally in Egypt, but are not allowed in any existing spotted breed of cat. They *will* be allowed in the Nile Valley Egyptian, from its creation, as will striped cats. Most domestic cat colors exist purely because those colors are all contained within the original DNA of the African wild cat. Since the NVE is the "bottle-neck", the "feline missing link" between the African wild cat and all domestic cats, they have to contain all the DNA that was passed on to all other domestic breeds. All other existing domestic breeds are either sub-divisions of the NVE, or they possess mutations of NVE genes. The only exceptions are the recently-created wild hybrids, and CFA doesn't even consider wild hybrids to be "cats" (according to the definition in their rules). I have some updates on the Nile Valley Egyptian project. We now have 2 cats officially registered with TICA as Experimental Nile Valley Egyptians. In a year, we hope to apply to have the "experimental" connotation dropped from the breed name when we apply for Registration Only status. I am attaching 3 photos for you to look at - see above. One is the original one that I sent you of Jameela (photo no 1). The second one is a photo of an African wild cat, felis sylvestris lybica (photo no 2). The third photo is of Jameela again, 6 months later (photo no 3). In that time, her spots have faded dramatically, her ears have gotten larger, and her legs have gotten longer. Except for her color and the broken necklace on her chest, she is the spitting image of an African wild cat. Our two registered NVEs are also showing signs of having their spots fade with maturity, much like lion cubs' spots fade as they reach adulthood. This is the clue we were looking for, that proves that Egyptian ferals are more closely related to the original wild stock than any other domestic cats in the world. Leslie must have a contact watching these blogs. The day after I sent my comments she answered my e-mail of over 40 days ago and the DNA project is still alive including the Cyprus "Cleopatra" cats that look like your Nile Valley cats. Regarding your observations on the Egyptian Mau and the Turkish Angora please note the following. I have sent a sample from the Ankara Zoo of a genuine Turkish Angora to UC Davis and it proved to be genetically a Turkih Van. All of the Angoras I saw in the Zoo were fairly identical morphologially, head type, fur type, etc. and bear no resemblance to the contemporary " Turkish" Angora, which is clearly an impostor. It is descended from domestic cats in the USA but does have Tunisian and " Egyptian " Mau genes, which is of course another concocted breed. The difference between the Turkish Van and the Turkish Angora is not due to geographic separation but due to the cat fancy Angora not being a Turkish cat at all. I know several people in Europe with genuine TAs who have also sent additional buccal swabs to UC Davis to substantiate the findings from my sample. Unfortunately Leslie lyons is not cooperating on this matter even after previously asking for more samples from the Ankara Zoo. I think she is defending her cat fancy friends and their phony Angoras and is still standing by her erroneous conclusion that the Turkish Van and Turkish Angora are not related. I told her that she had based her finding on receiving samples from cats that are not bona fide Turksh cats which skewed her findings. Now she doesn't reply to my e-mails. Before she got into this situation her report on the Turkish Van and associated feline Phylogentic tree proved extremely useful to me and blew the whistle on various breeds, but now she appears to have clammed up. Many of my friends are still waiting after a year for the results of sending in many samples of Turkish Vans and the cats of Cyprus. She is a big disappointment. I just posted a comment on this cats and now notice your Twilight who is exactly like my Kara Kedi Karim and his pure white brother Arkos. This type are quite common in Cyprus (Thanks to Cleopatra!). 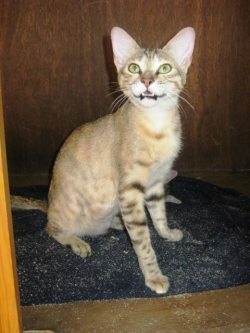 I live in Cyprus and have noticed a good number of naturally occurring cats here that fit the description of Nile Valley Egyptian cat/F s Lybica. 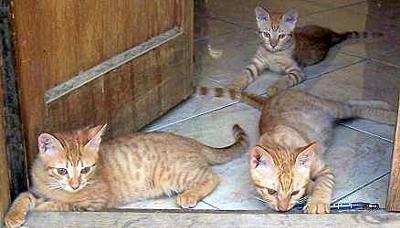 They are brown and silver striped or spotted tabbies. I currently have 3 such cats but know where there are seral more. I have played with the idea of showing them as cats which would have a more legitimate claim to the name of Eyptiam Mau. There was a lively trade between Egypt and Cyprus during the Ptolomaic dynasty and cats would surely have been onboard those ships. I am prsently engaged in the development of the Cyprus Aphrodite cat which I have theorozed is a cross betwen large Turkish Vans and some North African cat, possibly Egyptian, which accounts for their particualr characteristics which in main are a ssmallish triangular and a long muscular panther-like body, and often pure white. I see the Nile Valley Cat has that specific head type, the Turkish Van is pretty common here as well as the Ankara Zoo type of Turkish Angora. UC Davis' Cat Breed Diversity Project Report dated 6 Nov 2008, and associated graphs, establish the presence of the unique Turkish Van markers as well as Egyptian DNA in Cyprus cats ( my samples). I would like to post pictures of my " Egyptian" cats but I don't see any facility to do that together with this comment. 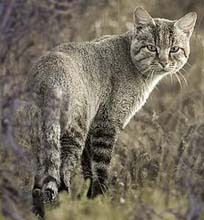 Pretty sure the African Wildcat is known as the "felis silvestris lybica"... just saying. Sorry, Athena. I am going more and more word blind. I have just corrected it. Hi, Michael. In your link to my Maati page, I noticed that you spelled it "Matti". Just thought I'd point this out, the link works fine. And thanks for the mention! We really appreciate it. This entry was posted in Cat Breeds and tagged cat breeds, Nile Valley Egyptian Cat, rare cat breeds by Michael Broad. Bookmark the permalink. Is this an Eygyptian Mau? Hi Tamara. Thanks for visiting and commenting. 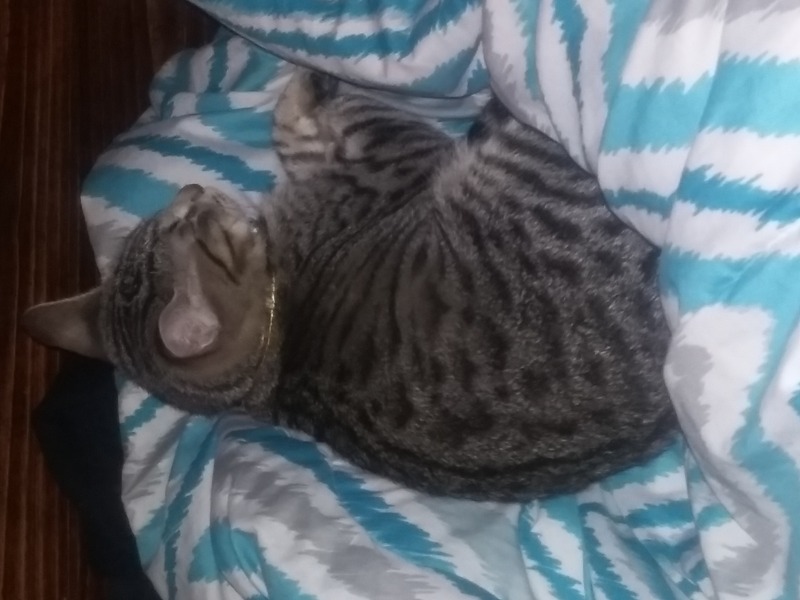 Your cat looks like a very fine spotted/mackerel tabby random bred cat. Thanks again for sharing.